Olson, Benjamin Hedge (May 2008). I Am the Black Wizards: Multiplicity, Mysticism and Identity in Black Metal Music and Culture. Bowling Green State University. http://etd.ohiolink.edu/send-pdf.cgi/Olson%20Benjamin%20Hedge.pdf?bgsu1206132032. ^ Weisbard, Eric, ed (2012). Pop When the World Falls Apart: Music in the Shadow of Doubt. Duke University Press. p. 279. ISBN 0822351080. ^ Phillips, William and Cogan, Brian (2009). Encyclopedia of heavy metal music. Greenwood Press. pp. 109, 234. ISBN 0313348006. ^ Chad Bowar: Retro Recommendation: Rotting Christ - Thy Mighty Contract, 24 June 2011, accessed on 13 December 2012. ^ Ben Ratliff: Thank You, Professor, That Was Putrid. In: The New York Times, 14 December 2009. ^ a b c d Dunn, Sam (2005年). Metal: A Headbanger's Journey (motion picture). Seville Pictures. ^ a b c Lahdenpera, Esa (1995). “Northern Black Metal Legends”. Kill Yourself!!! Magazine (4). オリジナルの2012年2月7日時点によるアーカイブ。. https://web.archive.org/web/20120207234358/http://www.fmp666.com/moonlight/mayhem.html 2012年9月4日閲覧。. ^ Incubus. In: Jon Kristiansen: Metalion: The Slayer Mag Diaries. Brooklyn, NY: Bazillion Points Books 2011, p. 88. 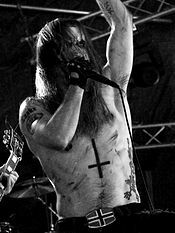 ^ Daniel Ekeroth: Swedish Death Metal. Second edition. Brooklyn, NY: Bazillion Points 2009, p. 249, accessed on 8 October 2012. ^ Wolf-Rüdiger Mühlmann: Impaled Nazarene. Tol Cormpt Norz Norz Norz. In: Rock Hard, no. 307, December 2012, p. 77. ^ Robert Müller: Wollt Ihr den ewigen Krieg?. Der tote Winkel. In: Metal Hammer, November 2011. ^ Wolf-Rüdiger Mühlmann: SARCOFAGO. I.N.R.I. In: Rock Hard, Nr. 304, September 2012, p. 73. 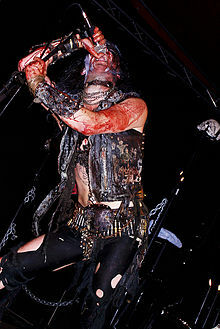 ^ Hendrik Möbus: National Socialist Black Metal, accessed on 2 January 2013. ^ a b Debub, Bill (2007年). Black Metal: A Documentary (motion picture). Bill Zebub Productions. ^ a b Moynihan & Søderlind 2003, p. 16. ^ a b c d Olson 2008, p. 27f. ^ a b Olson 2008, p. 7f. ^ Moynihan & Søderlind 2003, p. 313. ^ a b Halupczok, Marc (March 2010). “Waldschrate & Met-Trinker”. Metal Hammer: 30. ^ a b Frost (CD liner notes). Osmose Productions. (1994). ^ a b Nordic Metal – A Tribute to Euronymous (CD liner notes). Necropolis Records. (1995). ^ a b c Dome, Michael (2007年). Murder Music: Black Metal (motion picture). Rockworld TV. ^ Olson 2008, p. 2. ^ Olson 2008, p. 38. ^ Olson 2008, p. 47. ^ Olson 2008, p. 41. ^ Kristiansen, Jon (2011). “Worship Him!”. Metalion: The Slayer Mag Diaries (Brooklyn, New York: Bazillion Points Books): 467. ^ Moynihan & Søderlind 2003, p. 134. ^ Moynihan & Søderlind 2003, p. 137. ^ Ian Christe: Sound of the Beast: the Complete Headbanging History of Heavy Metal. New York, NY: Harper Collins, 2004. ^ Kristiansen 2011, p. 39. ^ Kristiansen 2011, p. 266-269. ^ Moynihan & Søderlind 2003, p. 39. ^ MLO. Misantropiska Lucifer Orden. In: Jon Kristiansen: Metalion: The Slayer Mag Diaries. Bazillion Points Books 2011, p. 551. ^ Fridh, Sanna. Satan: The Perfect Man: A Symbol and Gender Analysis of Satanism in Black Metal. University of Gothenburg, 2010. p. 6. ^ Moynihan & Søderlind 2003, p. 255. ^ FAUST LEAVES DISSECTION BECAUSE OF THE SATANIC CONCEPT, accessed on 25 October 2012. ^ INTERVIEW FOR THE FANS BY THE FANS. - Final Interview with Jon Nödtveidt -, accessed on 25 October 2012. ^ terrybezer: Unpublished Watain Interview Extras! Archived 2012年8月17日, at the Wayback Machine., 27 March 2009, accessed on 21 November 2012. ^ Black Funeral. Embrace The Sounds Of Grim Medieval Vampiric Black Metal.... In: Kill Yourself!!! Magazine, no. 3, 1995, p. 36, accessed on 21 November 2012. ^ Ophth: AntaeuS[リンク切れ], accessed on 21 November 2012.